Did you go apple picking this year? I, myself, most certainly did! 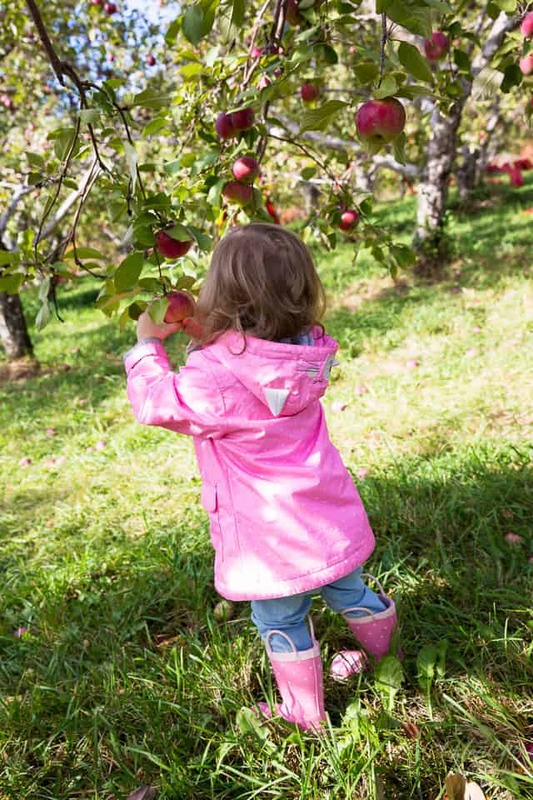 Apple picking would be my ultimate favorite thing to do in the Fall — for me, it’s the perfect opportunity to spend quality time with the family. It’s such a fun and relaxing activity to do with the kids (and grand-kids), especially when the sun is out and the temperature is on your side. I don’t know exactly what it is about apple picking, but for me, there’s something magical about the whole experience. And then, when I get home with my thousands of pounds of fresh apples, my ultimate favorite thing to do with them is Oven Baked Applesauce! I mean, it’s hard not to get carried away when you are surrounded with beautiful, crisp apples. Every apple is just nicer looking than the last, so you always want to pick just this last one, oh! and then that other one right there, it’s so perfect, so red, so plump, so crisp looking, so biooooootiful, surely you can’t just leave it there hanging on its branch, you NEED to grab it, to have it for yourself, to make it yours! First thing you know, you end up coming home with pounds and pounds of beautiful, fresh apples. 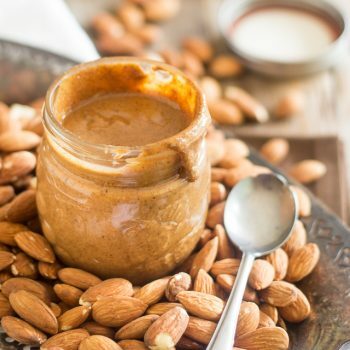 For the next couple of days and even weeks, you snack on apple upon apple, but eventually, you get a little fed up with them as they start losing some of their initial glow and freshness, you know. 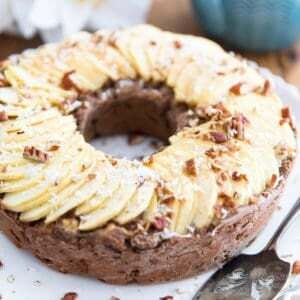 And then the “let’s bake everything apple” cycle begins… But even at that, there’s only so much apple cakes and apple pies, apple crumbles and apple everything you can eat! 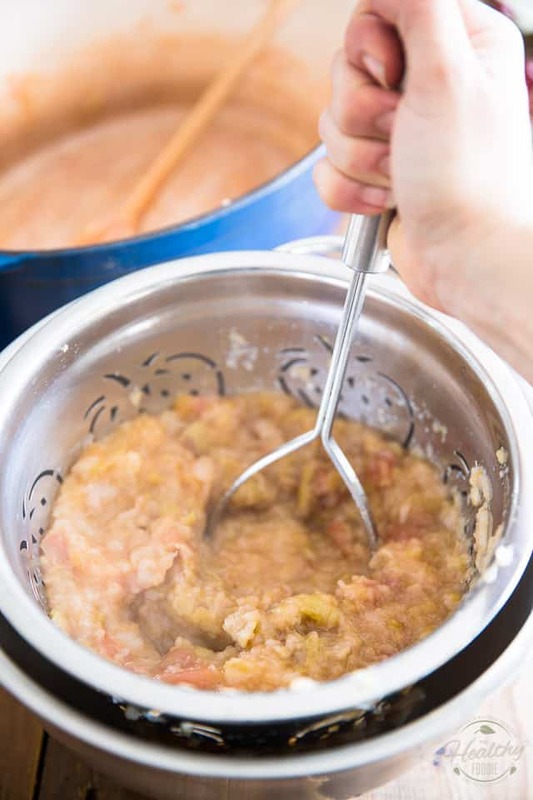 I know, the concept might sound a little weird, but if you’ve never made applesauce this way, you really need to give it a try. I’m absolutely positive that once you have done that, you will NEVER make applesauce any other way. 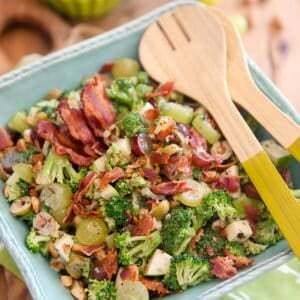 The finished product is unbelievably delicious, and the best part is, it practically makes itself. 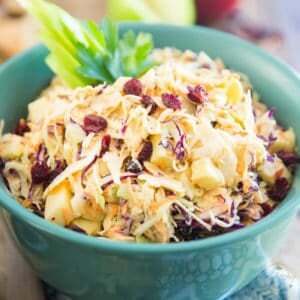 For starters, you don’t need to peel the apples. OH BLESS! I don’t know about you, but the one thing I really HATE when cooking or baking with apples is removing their skins. I have NO patience for that whatsoever. And that is precisely why I love this oven baked applesauce recipe so much! 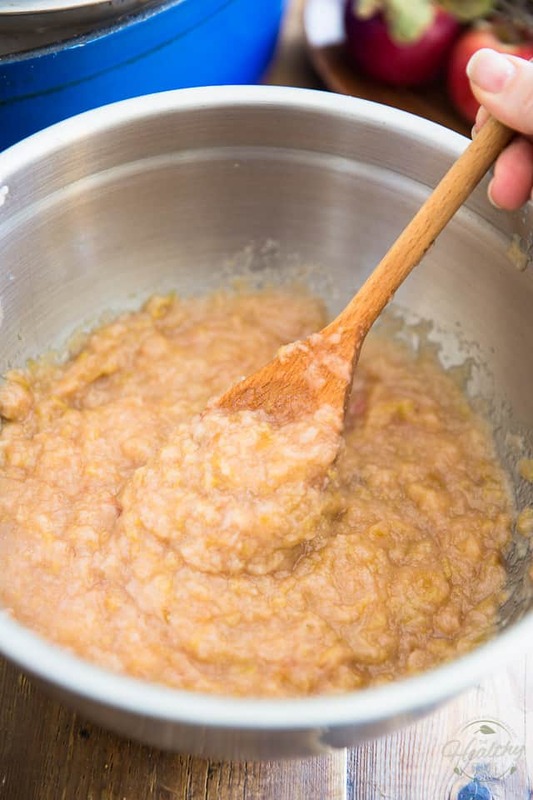 When making applesauce this way, not only do you not need to peel your apples, but in fact, you DON’T want to remove those skins. 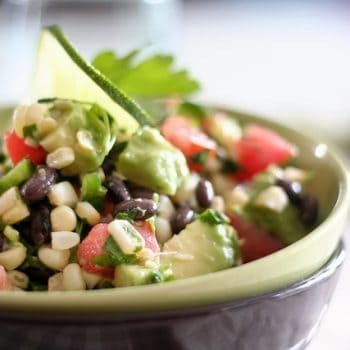 The fact is they actually contribute to adding tons of flavor and texture to the finished product. Fear not! When I say texture, I don’t mean that you’re gonna get all kinds of fibrous pieces of cooked peel in your applesauce; we will get rid of it eventually. But leaving it on during the cooking process does make the sauce thicker, more rustic in texture. Plus, as it bakes, the skin will “release” a lot of its beautiful red pigments, imparting a delightful rosy tint to the final product. Removing the core with a melon baller is super easy and really doesn’t take long at all, so it’s really well worth the extra effort. 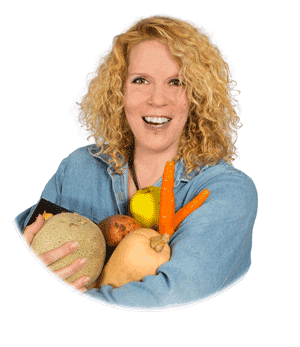 It depends on the variety of apples that you used, it depends on the quantity of apples that you crammed in that Dutch Oven, it depends on how big your apples are and how big or small you chose to cut them. Since I don’t mind having the oven going for an extended period of time now that the days got cooler (it warms up the house in a delicious smelling kind of way), I usually don’t bother cutting my apples more than I need to. I tend to only cut them in half, so I can core them, and then throw them right into the Dutch Oven. You’re looking at anywhere between 1 to 3 hours. Oh, and in case you’re wondering, you don’t need to add ANYTHING else to that Dutch Oven. JUST apples. No sugar, no liquid, no spices, no nothing. Trust me, you won’t believe the amount of flavor that comes out of those apples alone. 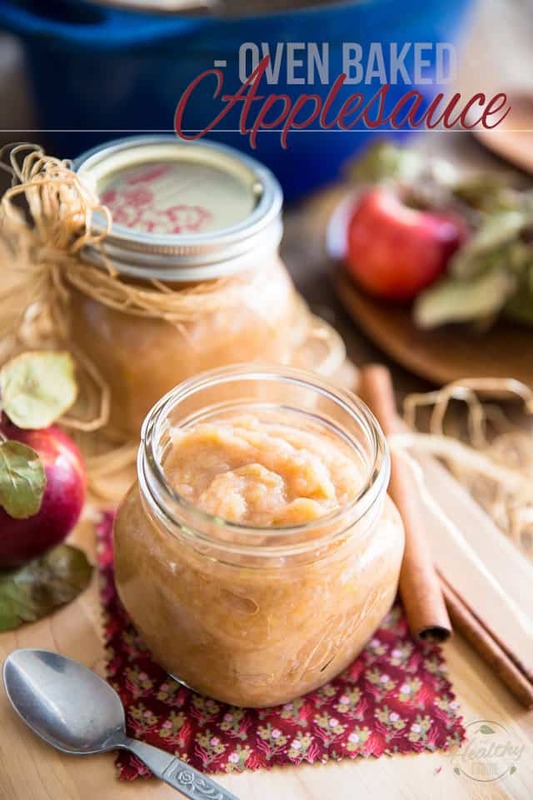 If you’re really adamant on adding cinnamon to your applesauce, simply throw a cinnamon stick in there — it’ll be more than enough. 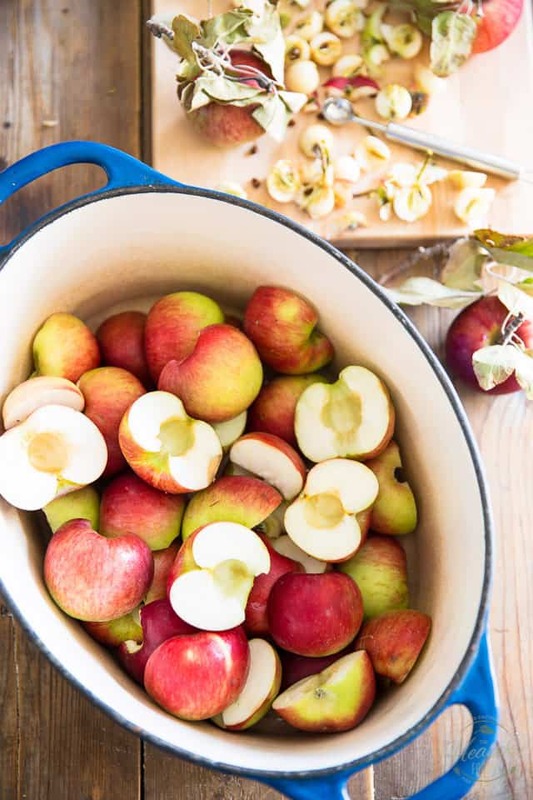 While your apples are baking away, simply check on them from time to time: give them a little squeeze or toss them around with a wooden spoon. When they get squishy and start to fall apart, they’re good to go. But trust me; stick with the program, I promise that you absolutely won’t regret it. Now all that’s left to do is process your cooked apples in a food mill, if you have one. I personally don’t have one, for lack of storage space. Besides, a colander and potato masher work just as well! Simply place the cooked apples in the colander (make sure to place that colander over a large bowl, to collect the applesauce) and then force them down the holes with the potato masher. While all the beautiful applesauce will have fallen into the bowl below. See the pretty color and rustic texture? 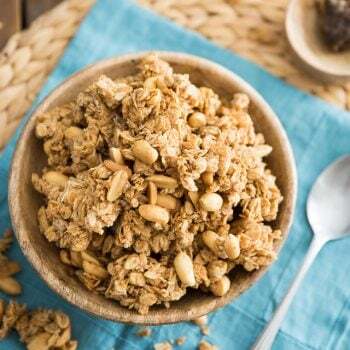 This is NOT your standard store-bought stuff! 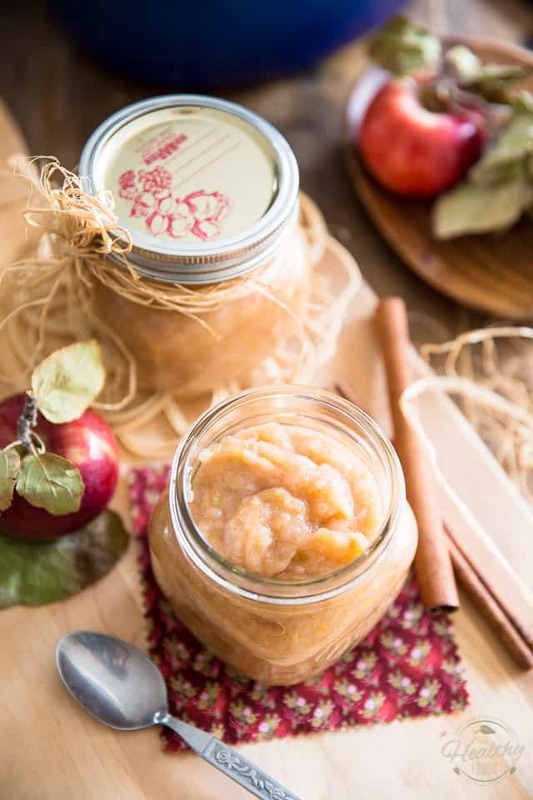 Now transfer your beautiful applesauce into clean jars and try not to eat the whole thing before you’ve even had a chance to put it in the refrigerator. I strongly suggest that you resist the urge: its already amazing flavor and color will get even deeper after it’s had a chance to sit and “age” for a few days. 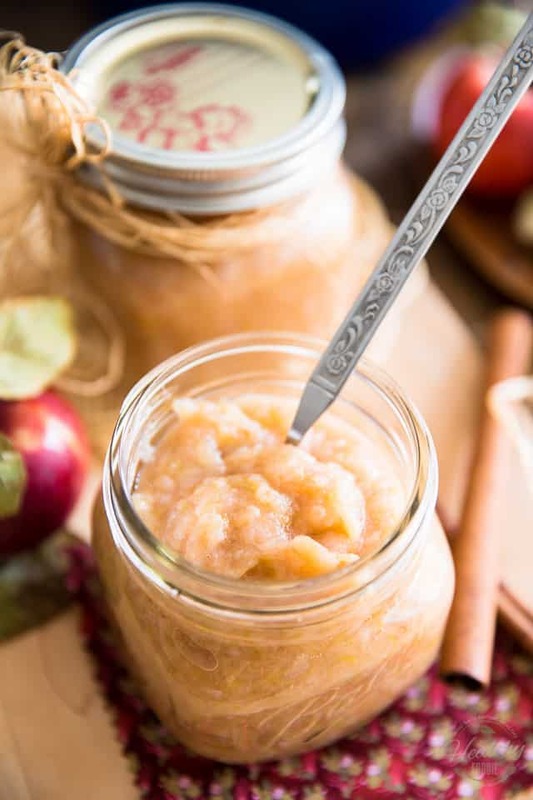 This oven baked applesauce will keep in the refrigerator for up to a few of weeks, but if you wanted to keep it for an extended period of time, you could freeze it for up to several months or even can it, in which case it would keep for years. Personally, I have no patience for canning, so I much prefer to freeze it, and make a fresh batch every year! Besides, if I wasn’t going to make a fresh batch of that applesauce every year, then what would I do with my thousands of pounds of apples next time I went apple picking? 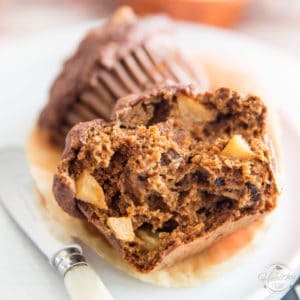 Place the apples in a 7 quart Dutch oven and bake until the apples get squishy and practically fall apart when you squeeze or toss them around with a spoon. 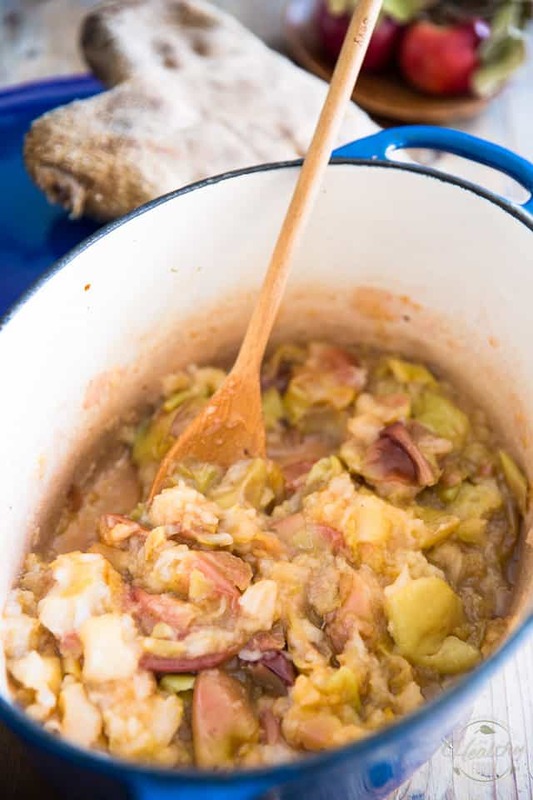 This could take anywhere from 1 to 3 hours, depending on the size of your apples, the variety of apples that you used and how much you stuffed into that Dutch Oven. Once the apples are fully cooked, let them cool for a few minutes and process them in a food mill. 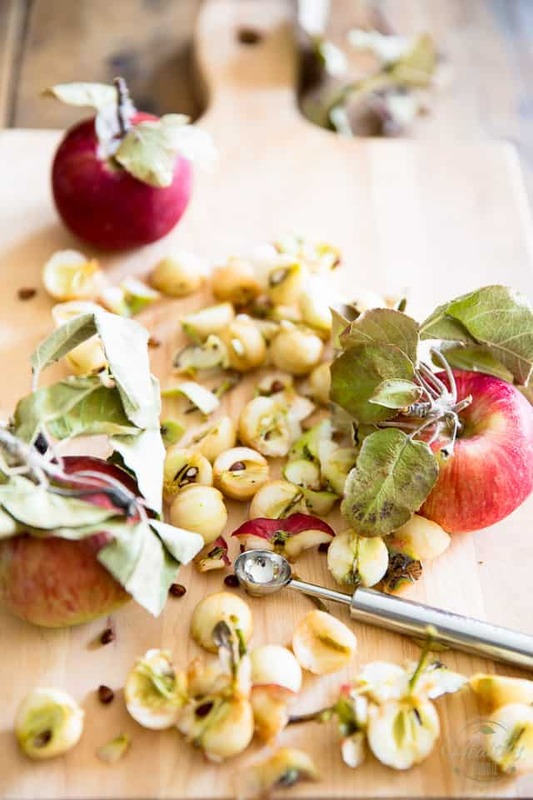 Alternately, if you didn't have a food mill, you could transfer the cooked apples into a colander (make sure to place that colander over a large bowl, to collect the applesauce) and then force the apples down the holes with the potato masher. 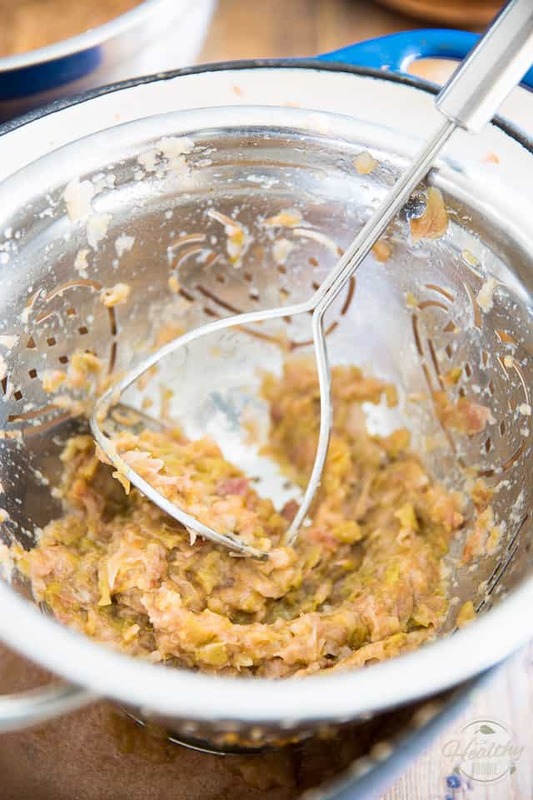 Transfer your finished apple sauce into clean jars; discard the skins that got left behind. 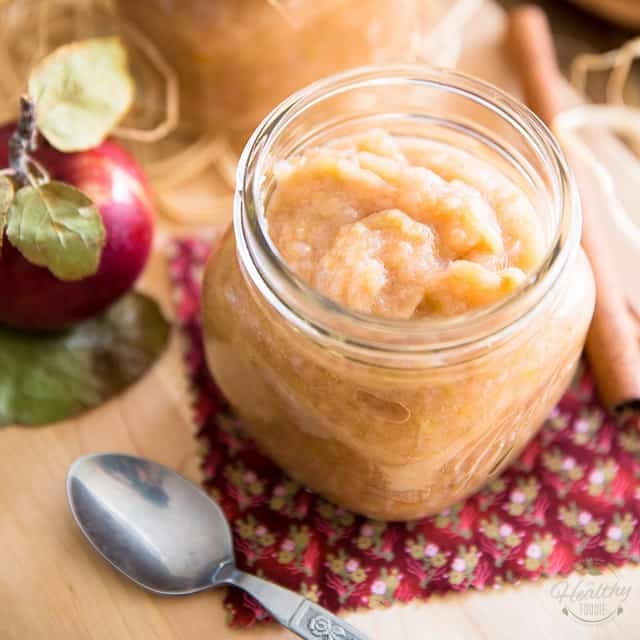 Your applesauce will keep for up to a few weeks in the refrigerator or can be frozen for up to several months. You could also can it for long time storage. It sure looks good enough to eat. HA! Also, thick enough to use as apple butter. I have no doubt the applesauce will be wonderful—I have been making applesauce on the stove this way (no sugar, no nothing) for years. What astonished me was the use of a melon baller to core the apples! I went out and bought one today, and got a casserole of apples into the oven in less than ten minutes! 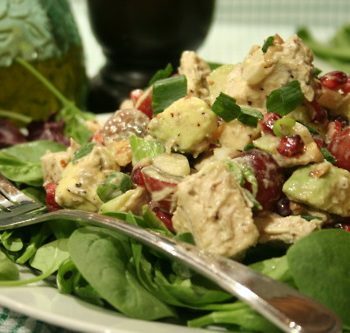 Thank you for sharing your recipe with us. Looks good, how much will three pecks make? Be careful in what receptacle you bake your apples in. I used two methods: a cast iron and a pottery crock. I used a steel colander as a sieve and both batches of applesauce tastes like metal. I enjoyed not peeling the apples, but did not achieve the quality of taste I was hoping for. Any tips??? ?